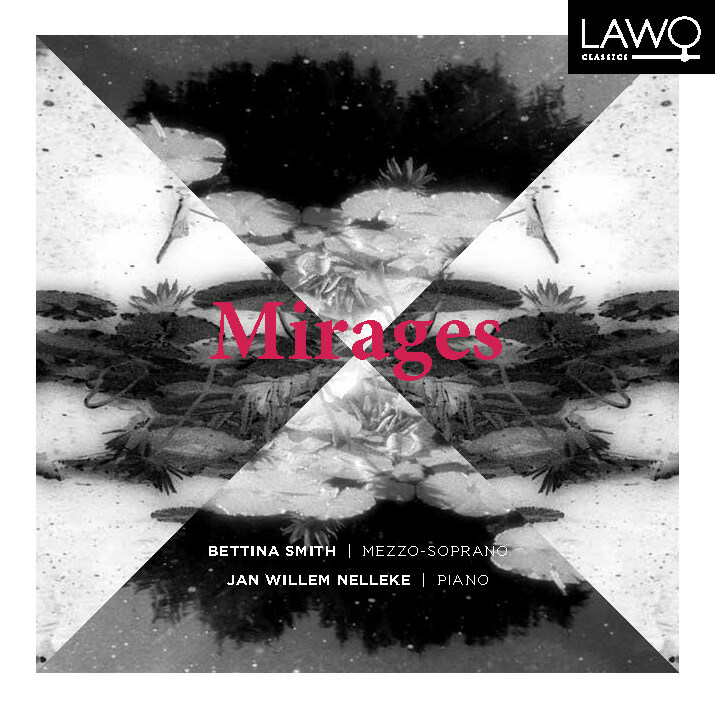 Norwegian Mezzo-soprano Bettina Smith’s supple tone and liquescent phrasing make her an ideal interpreter of the songs of Fauré. The excellent Dutch pianist Jan Willem Nelleke brings an exquisite touch to this album as well. Even connoisseurs of the great French composer will find surprises here; the superb interpretive powers of the two performers reveal new nuances in this music. Smith sings with remarkable control, and her vibrato is evenly spun, lending softness to her tone and never impeding her clarity of pitch. She brings to this repertoire a fine balance of fervor and restraint. Nelleke approaches these songs with a cool and precise touch, revealing Fauré the modernist rather than the romantic. The overall effect is one of stunning immediacy. The mini song cycle Poeme d’un Jour is based on poems by Charles Grandmougin. This three-song set finds Fauré at his most direct. The central song, ‘Toujours’, is a fiery cri de coeur and contains one of Fauré’s rare outbursts of sheer passion. This is followed by the exquisite ‘Adieu’, a tender, introspective song, eloquently performed. The most substantial set here is La Bonne Chanson, nine songs on poems by Paul Verlaine. It was composed in the summers of 1892 and 1893 while Fauré was staying with the soprano Emma Bardac and her banker husband in the suburbs of Paris. The cycle is dedicated to Emma, whom Fauré was apparently in love with, and who would later becomeDebussy’s second wife. Fauré’s infatuation with the soprano inspired some of the most daring harmonic inventions of his career, prompting his former teacher Saint-Saëns to declare, “Fauré has gone completely mad!” Some listeners may agree with Debussy’s assessment of this song cycle as “needlessly complicated”; still, it gives the performers an opportunity to display their technical prowess and is an effective contrast to the more conventional songs here. Mezzosopranen Bettina Smith er ute med en ny plate med fransk musikk signert Claude Debussy og Gabriel Fauré. Det klingende resultatet er den franske sangskatten verdig. Musikken er variert, den er beskrivende og romansene er skreddersydd for en dyktig sanger. Bettina Smith er en slik en. Det er ikke til å unngå å bli fascinert av den norske mezzosopranens varme klang. Diksjonen er ypperlig og hennes musisering sammen med pianist Einar Røttingen er meget god. Smith bruker stemmen på en veldig enkel måte – uten å dominere lydbildet, noe som gjør denne delikate og tidvis intrikate musikken godt. Komponistenes skriverier er fulle av musikalske kontraster – og musikken er en strålende ledsager til tekstene i disse romansene. Og duoen Smith / Røttingen innfrir på en plate som både er interessant vedrørende denne type musikkstykker av de to store franske mestere – og ikke minst er dette behagelig lytting. 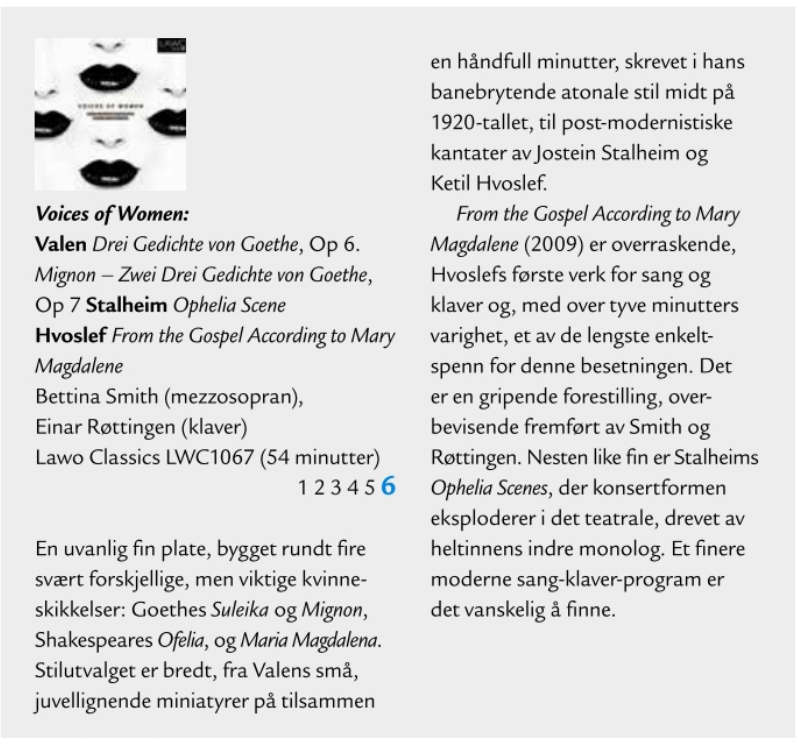 University of Stavanger’s report on Bettina’s new CD.